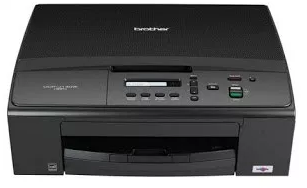 PRINTER BROTHER DCP-J140W has been present to replace DCP-J125. It has almost the same features as PRINT SCAN COPY and is interesting compared to its previous series, Wireless Network (Wireless). This WiFi can make it easier for GUTER friends to print or scan without a USB cable through Signal WIFI. With Signal WiFi, GUTER friends can maximize mobile print or scan from mobile. It's just that some of the features that were removed from the DCP-J140W, the screen that is only 1 line is monochrome, which is missing again is the direct print function of the Media Card. But the overall engine used by the DCP-J140W is the same as the DCP-J125 series of its predecessors. The ink type used by Brother LC-39BK (300 pages), LC-39C (260 pages), LC-39Y (260 pages), LC-39Y (260 pages), in our opinion this printer is suitable for use of 500-1000 pages per month. Recommended Paper Brands Innobella ™ Glossy 8.5 ″ x 11 ″ Photo Paper (BP71GLL); Innobella ™ Glossy 4 ″ x 6 ″ Photo Paper (BP71GLP), Brother Matte Inkjet Paper (BP60ML), Innobella ™ Glossy 8.5 ″ x 11 ″ Photo Paper (BP61GLL); Innobella ™ Glossy 4 ″ x 6 ″ Photo Paper (BP61GLP), and 3M 3410 Transparency Film. Sheet Weight - Paper Tray (max / min) 17-58 lb. Carton Weight (lbs) 19.4 lbs. Unit Weight (lbs) 15.0 lbs.